Been reading and trying to absobe this. Planning my first AG brew on Saturday and going to do the closed system. My schedule will be to primary as normal for the first 3 days and then rack to keg (which I will simply serve from) and cap at day 4- 10psi day 5 -15psi and day 6 - 20 psi all at 18 deg c. With the final week at 26psi as per CO2 chart to give 2.45 vols of CO2? Now ... My question is if I wanted to then chill in keezer for the final 7 days at around 1 deg do I adjust the sounding valve accordingly to the CO2 chart which would be more like 8psi? That's exciting Kenny, glad to see someone else doing this besides me. Many open ferment for two days first and then pour into their closed system. Be sure to leak test first. A slow leak adds up over a couple of weeks. Your answer can be found on post #1 first para as WortMonger states, the pressure will drop naturally with a temperature drop, so just crash chill and let the pressure settle itself. Post pictures here of your pressure related stuff. Thanks to Joshua for bumping the thread. I will be checking it holds pressure using the spunding valve tonight. Still having issues with photos from my Ipad being too big? there doesnt seem to be an option to compress them? Pity, got Keezer, control box and brew bench stuff I would love to share! First brew went so well... bang on efficiencies... In fact I might be a litre up in the fermentor. Oh was 1 point lower so really pleased with that! Just racked from primary after 48hrs into the keg and capped it with a view to start pressure building to 10 psi by tomorrow. How long does it take for the pressure to build? I have had it capped for a couple of hours and nothing registered yet? ( really sure there is no leaks) just like to know when to expect the needle to start to move? Since the Beer was racked, new Oxygen has been added, the those little Yeasty's are doubling/Tripling there Population and Not working on the Sugars now. Eating Sugar, Farting gas, and Peeing Alcohol!! Last edited by joshua on 29 Apr 2015, 03:55, edited 2 times in total. Did you have your spunding valve set for a known psi beforehand? Are you doing this in a Sankey, with what kind of headspace do you have? Hope you get pressure soon. Try cranking up the knob a little. Last edited by Mad_Scientist on 02 Oct 2015, 23:50, edited 1 time in total. Yes doing it in a 30 ltr Sankey. There is approx 28 ltr in there. I didn't set the psi last night as I wanted to build some pressure as well as the spending valve is new so wanted to get some pressure in and start to mark psi stages on the valve top! Got up this morning and it was sitting nicely at 5psi (that's after 12 hours) so set it to what I think is around 8psi for today....obviously I will be increasing a little day by day? Gravity had only drop 7 points when I transferred so a way to go yet! It's actually quite chilly (12c) here as an average so that will probably make things a little slower wouldn't it? Anyway...will keep you all posted! Well I've decided to join the club. First brew if fermenting away. Plan was to let it go 2 days wide open then increase to 5 psi the third day. Apparently I had a leak somewhere in the keg jumper. Some of the blow off ended up in the bottom of my freezer and it wasn't holding pressure. I have pulled the jumper off and put the valve on the keg and closed off the pressure. Day 5 and I'm sitting at 10 psi. Last edited by Lumpy5oh on 23 Jul 2015, 22:22, edited 2 times in total. Are both fermenters, what beer is it? I'm at day 5 too at 7 psi. Tomorrow I will pull a gravity sample and go to 10 psi. I have a low gravity, 1.056, dead guy going. Just one fermenter. The other was for the blow off. I've got a 1.073 Mosaic IIPA going. A question about setting the pressure on the keg. I am aiming for 2.5 vol in the finished beer. Brewer's friend is telling me at 20°C (current ferm temp) I only need 10psi to achieve my desired carbonation. My valve is currently reading 15psi. Should I dial it back or is this something to deal with when I go to crash it and cool the beer to serving temps? Edit: Never mind; I just realized Brewer's Friend can't handle 20°. It is telling me 27psi at 19°tho. Try to get to 27-30 psi at 20°C. What yeast are you using? I am using San Diego Super Yeast. Here's the info I recorded. Last edited by Mad_Scientist on 19 Aug 2015, 05:53, edited 3 times in total. Life caught up with me and I ended up cold crashing this for the last 2 weeks. At some point I had something fail and I lost pressure. I opened my fermentation freezer one day and I had only 5 psi and a little beer in the bottom of the freezer. I just transferred the beer to a second keg with my auto siphon and will let it carb up in my kegerator. The beer started at 1.073 and ended at 1.014 so not bad; I expected a little more. Already thinking about my second try. Hey Lumpy5oh, I see that as a total success. It's worth mentioning that my blow-off corny, that my spunding valve rides on, has a shorten beverage tube (out). I keep the spunding valve attached throughout the entire process and during the crash chill phase [to monitor pressure] as I don't want anything sucking back into the fermenter. Last edited by Mad_Scientist on 28 Apr 2017, 06:24, edited 1 time in total. I have not said anything in this thread about how to prepare a purged receiving serving keg. Recently I picked up on something new I have never done until now. I got interested in the low oxygen brewing website and picked up a (cold side tip) for us who is spunding. 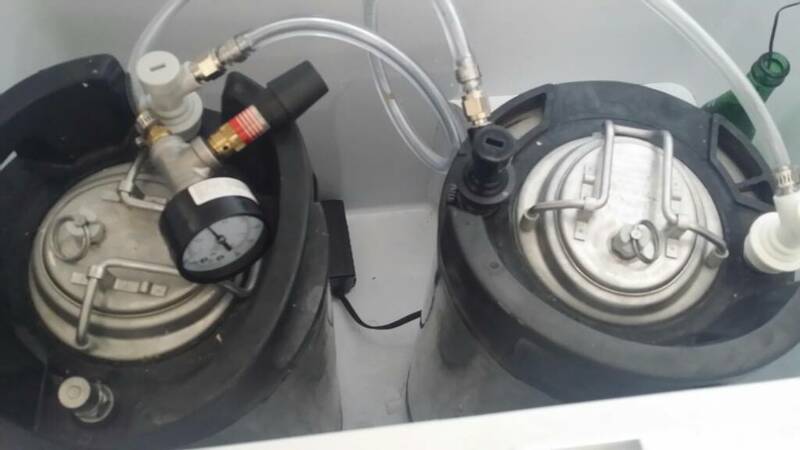 Remove the gas side post and its tube, fill the corny with water until it is near full, , install the lid, then start filling up the keg with water slowly keeping the keg at a 45° angle. Any air pocket from the lid will be replaced with water. When the water starts to exit gas port, stop water flow and install the tube and gas post. Push out water with CO2. You now have a purged keg ready for the pressure transfer.